Luckbox is a Bitcoin-backed betting platform set to launch in 2018. From some of the brains behind PokerStars, Luckbox is entirely focused on esports betting and the site aims to provide a fully regulated esports wagering experience, with player safety and security put first. Luckbox plans to allow customers to bet with fiat currency, cryptocurrency like Bitcoin, and in-game items or skins, also called skin-betting. While traditional bookmakers take bets on esports using fiat currencies and sometimes bitcoin, betting with in-game items and skins is virtually non-existent at licensed operators. Currently, only unregulated betting sites offer skin betting and wagering with virtual items. Luckbox wants to change that, and service that part of the esports betting community with the backing of actual proper licensing and regulation. An additional currency option, LuckCash, will be available. As Luckbox’s in-house crypto token, users can choose to convert their funds to LUCK to take advantage of better bonuses and features. All betting on the Luckbox platform will be “fully regulated and compliant with the highest-level gaming jurisdictions”, as to ensure customers are betting on a secure platform. The aim is to receive full licensing from the Isle of Man, a well-regarded online gambling jurisdiction and regulator, to allow the launch of full scale marketing and a mobile app. Currently, the beta of the site has confirmed it will offer odds and betting markets on the most popular esports titles, including Counter-Strike: Global Offensive, Dota 2 and League of Legends. It promises to provide features that allow esports fans to engage with other fans while betting and watching each match and tournament. How will Luckbox be different to traditional betting sites? As already mentioned, Luckbox has caught our eye for its commitment to focusing entirely on esports and the unique betting experiences surrounding it – fiat currency, cryptocurrency, betting with in-game items and skins betting. Many of those things are unavailable at traditional sports betting sites, and there are very few other esports-only betting platforms that have the compliance and licensing Luckbox promises in their aim to fill that gap in the market properly. If Luckbox can get this thing off the ground running, we’d say we’re excited to test their platform out and see if it stacks up. Esports betting is still undervalued at traditional bookmakers and it’s also too uncertain bet on your favourite games at other “specialist” esports betting sites with no licensing or regulation, so there’s a limited amount of options for some. Luckbox’s numerous currency options, such as skin betting, may also enable bettors from countries that cannot use traditional payment methods for online gambling purposes to still be able to play, a service which cannot be understated. The Luckbox idea was created by Lars Lien and Mike Stevens, two former PokerStars colleagues with extensive experience in the online gambling industry, and an intense love for the esports competitive scene – something crucial that management at many traditional sportsbooks don’t possess. Luckbox points to the way traditional bookmakers failed to offer odds on competitive gaming events until 2015, with poor understanding and player experience something they specifically want to avoid with Luckbox. The Luckbox idea began in earnest in 2016, when Lien and Stevens successfully raised 483.5 Bitcoin from contributors and their connections in the cryptocurrency industry. They plan to host an Initial Coin Offering (ICO) to raise the remaining funds needed to launch the site properly. The ICO sale will offer a utility token, LuckCash, to be used only on the Luckbox platform. There are plans to be able to trade it after launch to investors, which will let them hold a profit share entitling the owner to 20% of Luckbox’s annual profits. Both men believe the ICO will allow contributors to share in the long-term success of Luckbox with its two-token structure, and give them extra peace-of-mind about their seriousness of the business, given many ICO initiatives have recently been criticised or classed as scams. Where can I bet on esports in the meantime? There is a decent number of top-rated and licensed esports betting sites currently servicing international players you can sign up at while waiting for Luckbox to officially launch. While many sites still improving their available odds and esports betting markets, most already offer competitive gaming fans great value and choice if they wish to bet with real money. Arcanebet: An esports-focused online bookmaker with numerous markets up for both popular and niche competitive gaming events, including CS:GO, Dota, Hearthstone, Heroes of the Storm, Overwatch and World of WarCraft. BetOnline: A US-focused online sportsbook with its own specialised esports section, offering markets on most popular games including CS:GO, Dota 2, League of Legends, Overwatch and StarCraft II. Betway: A EU and UK-focused online bookmaker heavily involved with the esports scene as the primary sponsor of professional team Ninjas in Gaming, and supporter of Dreamhack, ESL and other events, offering markets on CS:GO, Dota 2, League of Legends, Overwatch, PUBG and more. 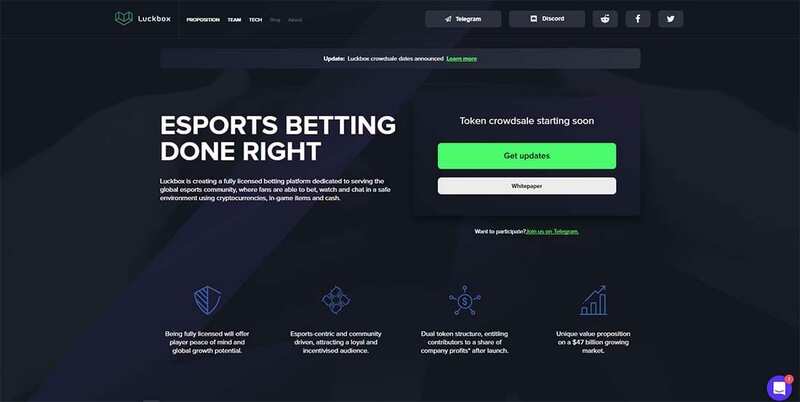 Pinnacle: The first sportsbook to take bets on esports way back in 2010, Pinnacle has established a strong repuation with the esports betting crowd thanks to early markets and low mark up on the odds. Pinnacle offer betting markets on CS:GO, Dota 2, League of Legends, Overwatch, PUBG, StarCraft II, WarCraft, World of Tanks and more.